Ep. 072: Andrea Gerstmann – Animator, Background and Character Designer, Storyboard Artist and more! 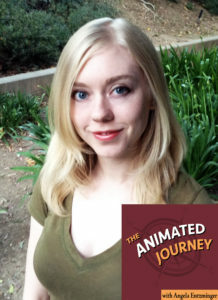 Episode 072 of The Animated Journey features animator-designer-storyboard artist-shorts creator Andrea Gerstmann! Andrea journeyed from Canada to the U.S. to pursue her career in animation. Since arriving in the states she has worked on numerous shows including Pig Goat Banana Cricket, Pinky Malinky and Apple & Onion. She also created the fantastic Nickelodeon short Dog and Squirrel, and her Loop de Loop shorts are hilarious. Join us as Andrea shares her story! Ep. 037: Morghan Gill – 2D Artist at Kabam and More! In today’s episode artist and animator Morghan Gill shares how her love of animation inspired her to attend Laguna College of Art Design and pursue her dreams of becoming a professional artist. She discusses what it’s like working for various studios, teaching at her alma mater, tabling at conventions and her successfully funded Kickstarter campaign for her latest sketchbook, Project Pink. It’s a fantastic episode you won’t want to miss, and make sure to sign up for her painting workshop at the Ground Zero Animation Expo in February! Los Angeles Area Events And More! Eliot Min went from being a concept art at a video game studios like Harmonix, 38 Studios and Disney Interactive to forming a team and creating the epic 2D fighting game Cerebrawl. In today’s interview Eliot shares his journey from going to art school to being a game tester and eventually raising the funds needed to quit his day job and embark on his fantastic new journey. For anyone who loves games and dreams of choosing your own adventure, this interview is for you!